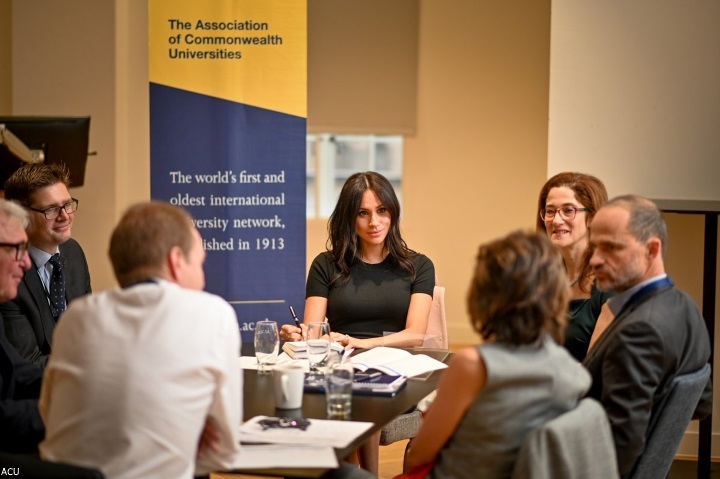 The Duchess of Sussex joined university leaders, academics and international scholarship students for an event hosted by the Association of Commonwealth Universities at King's College London to discuss higher education opportunities for young people all over the world. Discussion focused on the role of universities in addressing human trafficking and modern slavery, gender equality and inclusion, peace and reconciliation, and climate change and resilience. The ACU shared a photo of the Duchess during the meeting taking notes. 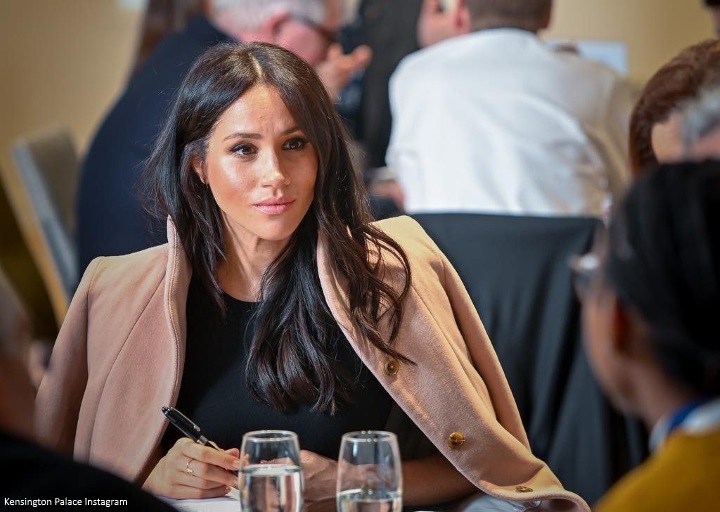 The Association of Commonwealth Universities said: "HRH the Duchess of Sussex attended the event and took part in discussions, following her first official speech to students at the University of the South Pacific in Fiji in October 2018." 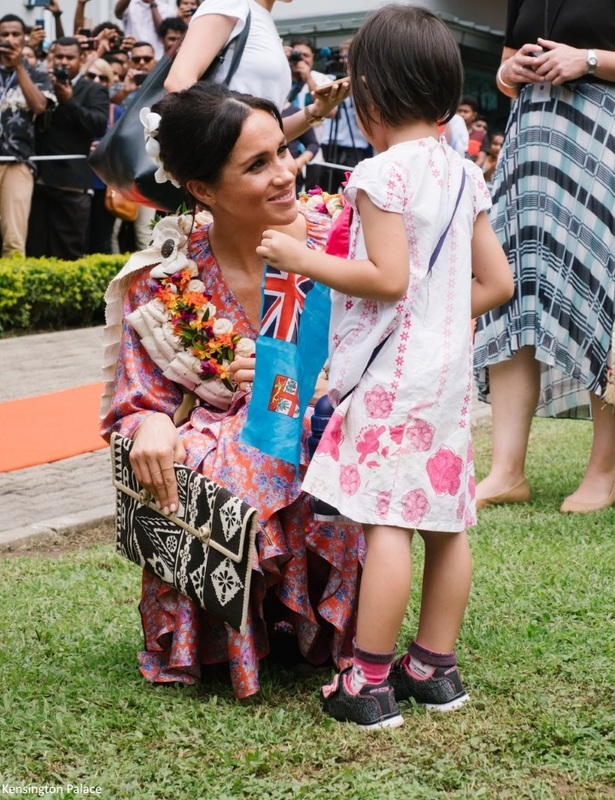 During the speech in Fiji, Meghan announced two new grants awarded to the University, allowing them run workshops to empower female staff and to support students during their education, provided by the Association of Commonwealth Universities. During the speech in Fiji, Meghan said: "I am fully aware of the challenges of being able to afford this level of schooling for many people around the world - myself included. It was through scholarships, financial aid programmes and work-study where my earnings from a job on campus went directly towards my tuition - that I was able to attend university. And, without question, it was worth every effort. Everyone should be afforded the opportunity to receive the education they want, but more importantly the education they have the right to receive. And for women and girls in developing countries, this is vital." Following the meeting experts and groups shared tweets. The ACU said they were "honoured" to be joined by Meghan. Professor Laura Hammond noted the group had an "excellent" discussion. Established in 1913, the Association of Commonwealth Universities is the world’s first international university network, and remains the only accredited organisation representing higher education across the Commonwealth. Founded to lead ‘common action in matters of common interest’, the ACU is governed by its member institutions through an elected council. A UK-registered charity, it received a royal charter in 1963 and, in 1986, Her Majesty the Queen became its patron. I suspect at some point in the not too distant future we'll see this patronage passed on to Meghan. Education is incredibly important to her and will form a key part of her future work. The Duchess wore a cocoon coat, black short-sleeve sweater and skirt for the meeting. Meghan's coat is the $350 Artizia Wilfred Cocoon Coat in 'petale' (with many thanks to the Meghan's Mirror team). 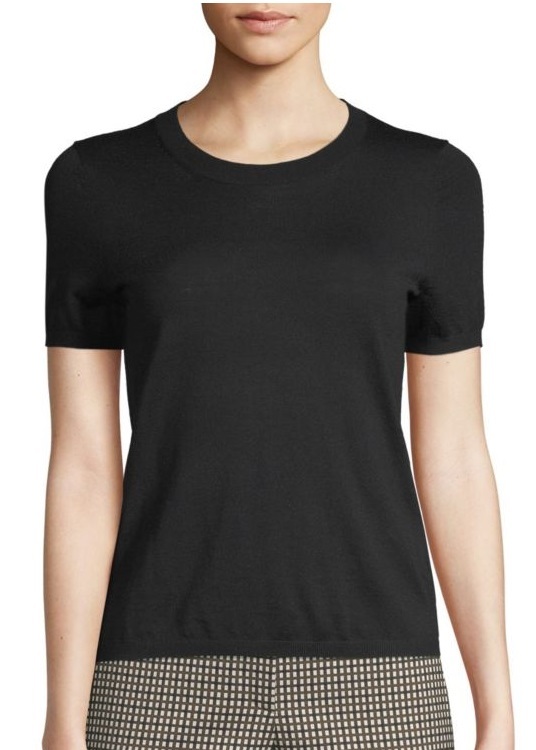 The talented Elizabeth from Meghan's Fashion identified the top as the Hugo Boss Filonka Short-Sleeve Sweater. It's on sale at Saks Fifth Avenue. It's fascinating to get a glimpse into Meghan's private work and the research she's undertaking ahead of the announcement of her patronages and future projects. It's also interesting to see her work with the ACU in Fiji and now London. The Commonwealth encompasses a plethora of diverse nations. I expect it's important to Meghan to focus on work that can impact across member nations in addition to the UK. I wouldn’t be surprised to see this patronage passed on to Meghan either. It’s clearly something she’s very interested in, and I think it’s a very important subject she can lend her time and name to. I look forward to seeing what happens with this in the future. Her "look" reminds me of preengagement photos---she looked so pretty and natural and comfortable within herself. I forgive her for not giving the world a full view. She should be able to be as private as she wishes. She's a smart and caring and driven woman and this sounds like a great match for her. So chic, so class, so beautiful and very determined woman. I really look forward to getting to know her causes and charities. Excellent subject and it looks like she got a haircut! Very pretty. Hope we see her at a more public engagement soon. I bet she's wearing comfy jammy pants and pink fuzzy slippers! Seriously though pregnancy certainly agrees with her, she simply glows. I'm very excited to see the causes and charities she champions going forward. I believe that the Commonwealth and those nations and causes will play a large part in her choices. Meghan is a student at heart. I am sure that all the patronages she attaches herself to will be well researched in advance and she will maximize her efforts on their behalf. In true Meghan fashion she has been working behind the scenes and when ready will be presenting to us a well laid out plan of action to be most beneficial. If the Hub Kitchen is a good example of her work ethic the patronages she chooses will be very lucky to have her. She is looking quite serene and lovely in the mist of her working meeting. I echo everything you've said USA Granny! You said it all! I completely agree. Wow she looks just like she did on Suits. So smart and chic and obviously there to work. She always looks attractive but I do not think she looks very professional in this snap. So what does she look like ali? I think she looks like any student, instructor, professor, industry leader---she does not look like she is attending a garden party or flower show. When I went to college, the smartest people at the university dressed down. What she is wearing would be very dressed up! She also has a "focus on what I'm doing and not how pregnant I look" look. I think she looks perfectly appropriate for the meeting. She's in a black top and skirt and is neither too dressy or too casual. I always am happy to see Our Meghan ���� growing into her role and choosing her patronages with research and care. The work is the thing, bless her. Great Good work Meghan continue with your tasks of changing the world. I wouldn't be surprised if Meghan will choose ACU as her first patronage. It fits perfect for her deeply concerns about education,Commonwealth and women. Wow, what a look of determination on the face of the Duchess of Sussex. The beauty is there but the eyes show a passion to change the world. Thank you, Charlotte. The ACU has some really tough issues to tackle and I hope they are successful at doing so. The world is so full of problems and it would be nice if we could all work together to solve them. Great post, Charlotte. I enjoyed it. I’m glad the last two engagements for Meghan were not released to the public until after they were over. For me, it’s about the work. If the Duchess of Sussex looks good getting it done, more power to her. Let us all work to make the world a better place in which to live. That's what I call a "working Royal" - pen in hand, taking notes! Probably some palpable action will follow from this for the Association. Meghan is really bringing a new modern vibe into Royal activities. YES this, exactly! She isn't just shining a light on causes (which is well and good, of course), but she's also lending a hand, doing the research, and finding out what actions she can do to help. I think this is 100% why she's my favorite royal. Dahish princesses had also be seen taking notes during their meetings, so it's pretty normal. Megan is just like one of them. I think Meghan is interestingly beautiful. I hope unlike the press she is able to unleash her mind and grace to all the British people who adore her and I pray that Harry stands with her. I adore Meghan she represents all that is graceful and good. I hope Harry doesn’t let any one intimidate his love and support of our girl. Yes, Nicole, that is a good point! Feels like she is an active participant and plans to continue to be. I read that Harry is now on the hit list of a white supremacist group and perhaps that is a reason why H&M's recent outings have been private, I imagine there are many groups targeting them and their security is no doubt ramped up. Meghan seems like the type of person that has always worked hard and can’t sit still for long. Glad to see that she is continuing to pursue passion projects and not slowing down because of bad press. I wish there had been more photos. But understand she wants the focus on the event. Not on her fashion or the bump. With that being said. I think another outlet identified the coat. 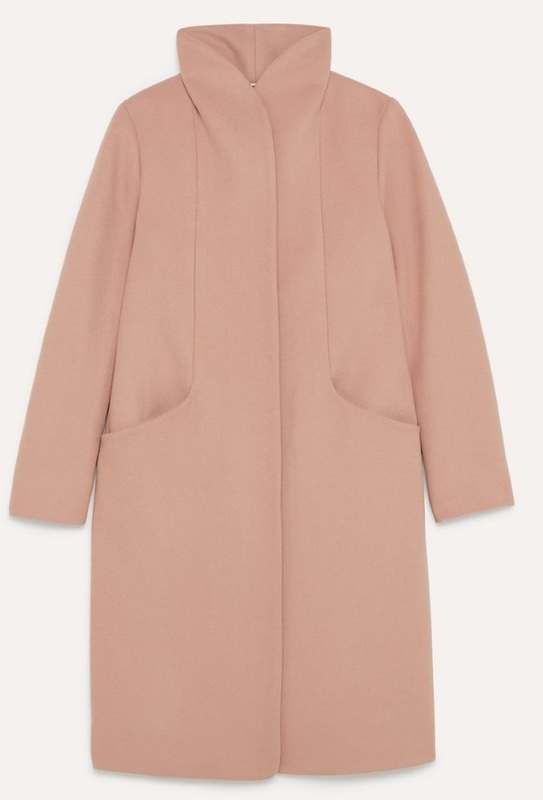 as a cashmere blend coat from Wilfred for Aritzia ($350). She looks radiant and it is exciting to see the causes she will champion as a new royal. I wonder if there will be any more surprise visits before Christmas! That's such a pretty coat, I love how the front seaming segues into the open pockets, the cocoon shape is pretty while still being sleek. A welcome break from trench macs. I wondered briefly if Meghan had gone back to Lavender Hill for her top, but apparently she's opted for designer this time. Keeping her looks as uniform as she does it's hard to tell at first glance and I'm in awe of the sleuthing here. Allison is US @ 16:55. I read about the “hit list” also this morning. I hope all will be well for Prince Harry and his wife. Everyone is NOT a racist but racism is real and hate kills. The Duke and Duchess have my sincere concern and prayers. 🙏🏽. I think I love the coat! That is a great color on Meghan. I wish we could see a full length picture since I am curious about baby Sussex. Meghan is brave. After all the nonsense about her over at DM, especially the last week or two, I would want to take a vacation out of the country. IMO, this is mean talk about a pregnant woman at a happy time in her life. I wonder if we will ever find out the source of the negative talk. I am no fashion maven, but her coat clearly has buttons. The indicated one does not. In any event, a wonderful meeting which bodes well for the future. The update shows a lovely petal color coat. That particular color is very much in vogue in the USA at present with designers showing it in shoes and handbags as well. I have admire it but not purchased. I believe it is considered a neutral pallet. I love the cocoon style coat. The style is comfortable and casual and easily supports many fashion statements. It was unexpected to see further photos released but since we have not seen her for awhile it is nice to see her working behind the scenes and looking so well. I have just noticed a new film to be released presently named, NONA. It is the story of a woman caught in human trafficking. At first glance it appears to be a love story, unfortunately it is not. I think it will be extremely impactful and insightful bring our attention to a horrifically overlooked problem within the world. I mention it because human trafficking appeared on the agenda of the ACU Educational Conference the DoS attended this past week. I know little of this awful practice but I am interested to know more and I thought others may have an interest as well. Education is power. USA Granny, this is such scary stuff. I admire MM for joining with those who are brave enough to tackle some of the world's worst problems. it's huge, recently there have been a couple of busts right here in our little town, a ring led by a woman from China who is a naturalized US citizen and about six months before that in a random traffic stop the highway patrolman had been to training and realized the girl in the back seat was being trafficked. I support an organization that operates in India and Europe. One of the directors served during the GW Bush administration on a US taskforce. Part of the focus is on big sporting events, the bowl games, World series, Olympics, etc where lots of people are moving around. Recently there have been reports of women disappearing from Native American reservations. There is another organization that works to try to protect kids (both girls and boys) who are aging out of foster care because they don't have support structures in place to provide safe places and they tend to get sucked in. Oops! Forget my earlier query about the coat...I can see it has hidden buttons/inner placket. Told you I was no fashion haven hah! BTW am I right in thinking that this is a cocoon coat because of the shape of is there more to it? This coat reminds me of the coat Kate wore to Cheltenham races when she was pregnant with George. I recall a discussion about buttons then, too. They had been set over to make room for her expanding figure. There was a mark where the former button site had been. I was thinking that MM's friends were just dying to throw out something to defend their friend and knew they shouldn't---today Serena innocently detailed a short conversation she had with MM, who is SO nice that Serena had to tell her not to be so nice. I thought it was a pretty cute way to tell everyone that MM is not like the wild stories we are hearing. I agree, Allison. She’s in the smart business style, quite professional. It’s not a hat and heels event. She looks to be in learning mode. Good to hear about this important education event and Duchess Meghan’s participation. It is a topic that she has previously shown interest in, before becoming a member of the BRF. It’s nice that she is able to continue learning & contributing to meaningful issues. Is she not doing anymore "public" engagements for the year? Just gearing up for the new year? Late getting to this post, as well, but it's always so encouraging to see Meghan hard at work. I think this is an incredibly important cause and something that will likely become one of her patronages. Meghan is all about the work and how she can bring positive improvement/change to each area. I really respect her for that and think that's exactly why she's such a huge asset to the BRF. I can't imagine how it must feel to try and sidestep so much horrible press, but she seems to be forging ahead valiantly. More power to her! I think it would wear on me. I wouldn't be surprised if there are very few public engagements, and then I expect to see her covered with a large coat. The media has been so terrible to her that they do not deserve to see her! Also, everyone, including myself, is focused on how large she might be and that really is too invasive. Suggesting, as I have, that she might have twins must be upsetting. And increased security risks, added to the risks we don't know about, should keep her from being in the public. I remember the snipers on the roofs that were needed during their tour. Not the like the old days when the two of them could pop out to buy a Christmas tree. I think Harry is protecting her from everything and everyone, which I find very sweet. I think the "feud" stories are dying down a bit with a new focus on William being unsure about Meghan at first. That sounds like it could be true -- but that was more than a year ago. The sudden discovery of a photo that Prince Charles has of him and Meghan is a nice touch toward dispelling these stories. I am so tired of these stories of family feuding within the BRF. If it is true about William, I think it is especially sad, because Harry has always seemed so attentive and kind to Kate at events. Doesn't Harry deserve the same kindness toward his wife Meghan? I'm thinking that William was just concerned that Harry would end up heartbroken. We read about Harry accusing William of trying to break up his marriage but I think it was probably a one-time discussion more than a year ago. Harry got mad, Charles stepped in, the Queen liked Meghan, William sees that she is great---could be that it happened this way. I don't have a feeling for what William is like but at this point, if anyone doesn't like Meghan, then they can just be in the minority. Of course, I don't really know any of them. :) And maybe jealousy---maybe William and Charles have been a team that worried about Harry and now Harry and Meghan are super close to Charles. Maybe William and Kate miss Harry's reliance on them. It does seem like the feuding part happened a year ago and is over. Great exaggerations like Meghan and the musty church and Meghan and the emeralds. They sound like Harry Potter chapter titles. I believe the part about Harry not allowing criticism of Meghan -- why should he? Why would anyone believe anything that is written by these tabloids.? If this story is true, it could be something as simple as William saying, "You haven't been together very long and her life is so very different, are you sure you aren't moving too fast?" It seems like William is the more cautious brother and Harry more impulsive, and it's a reasonable question to ask, I think. It doesn't mean that William isn't nice to Meghan or that he doesn't like her. Allison, I agree. I think Harry must be (rightfully) fed up with the media's treatment of his wife. Why reward the media with more pictures of her? I would do things in private for a long, long time if I were her. Every picture of her is a ton of money for each tabloid. I imagine they are exploring ways she can make a difference behind the scenes with fewer public engagements. She clearly is going to be a hard worker and make a difference no matter what. I think the cookbook was a perfect example where she worked privately for many months and then did a public event and it sold many many books providing a great income for the ladies' soup kitchen. If the story is true, if the conversation even happened , then it was likely as Marianne from NJ said. What sibling would not question a new relationship or be concerned about heartbreak ? I was 36 when I met my husband and knew by the third date we would be married. He asked me about four months later. We planned our wedding for the following year. Our time line seemed quick. I knew it was right , but my family and friends had questions. They cared about me. I don’t believe H&M are moving out of KP because of an argument. Every new couple deserves time to themselves and an opportunity to create a home that is their own (not his or hers) if it’s possible. I try not to believe any story but some stories see like there actually is nothing wrong with he event. Did MM want to "refresh" the wedding venue---maybe but I'm sure it was fine when the suggestion was denied. If Kate did cry at Charlotte's fitting, it probably was because her little girl was getting so big so fast. If Meghan was refused the tiara with the emerald, it's probably because Eugenie wanted it. And may had wanted it for years. Nothing wrong with William questioning the suddenness of the romance; he knows what the wife has to go through and he of a people would not want to have Harry's marriage end because of the demands of the position. Most of the events are things we do everyday. as far as the aides quitting, even the 'haven't a clue" father admits that the duchess is demanding but never rude. If a man is too demanding, he would be praised for his work style. A woman is viewed as a diva. I have been seeing MM not stay out too late and her early morning routine is refreshing. That's how to get work done. "...early to bed, early to rise, makes a (wo)man healthy, wealthy, and wise." Perhaps Meghan is a morning person. Very irritating for us night people. Ha! She should add to the job application for assistants: "Must be Morning person." I hope and wish everybody including her father's side simply leave her alone until after she has the baby. The DM article concludes with a request for Harry to do something about it, " man up Harry". How can an in-law "man up" with people he never met, and his wife had not healed from the drama yet? The most important thing he can do right now, is completely PROTECT his wife FROM STRESS while she is carrying their baby. It was bad enough she had to do several flights, show up for a grueling scheduling, meet and shake thousands of strangers during her early pregnancy in the recent tour. As to "Samantha the Panther" / the Australian private secretary adding on to the number of aids leaving, she was supposed to have been there for six months. Many administrators / managers/ bosses bring their own people when they arrive at new jobs. There could be a work culture differences between us and BRF staff. Meghan will have to hire her own aides with a mix of loyal US nationals and native British and others. But what I really want is mr Charlotte to do the Christmas banner! Mr. M., Bless His Heart, has dug himself in deeper. In attempting to justify his actions he managed to grossly insult his son-in-law. The evidence that was supposed to prove heart attack and heart surgery only proved that someone had been given instructions for after-care for "congestive heart failure." Not post-heart attack or post Bypass. CHF is a confusing term..."failure" meaning neither heart stoppage nor heart attack. If a medication regimen and instructions for healthy life-style and diet are not followed, CHF can be a precursor to heart attack. From his expanding abdominal girth it looks as though neither regimen is being followed. Another reason for that girth could be evidence of liver failure; however, he speaks only of heart problems. One thing is certain, one does not drive from the Mexican border to L.A. two days following heart surgery. (his initial excuse for missing the wedding was heart "surgery," not just heart attack. The story has been adjusted) Judging from his offered "evidence," there is nothing that indicates he had open heart surgery. The radiology fee could indicate a procedure called a heart catheterization-but it is probably not enough for an Angioplasty, which would indicate heart blockage following a heart attack. By the way, he mentioned the doctor referred to his condition as the "widow-maker," which involves more than the one coronary artery. It is possible that some at the hospital were aware of his connection to Meghan and the up-coming royal wedding; how could they not be ? His care may have been given with this in mind. He may have had a longer stay in ICU than his Congestive Heart Failure diagnosis may have indicated. What is concerning is if that the man actually believes that diagnosis means heart attack and presented it to the reporter as evidence of a heart attack- which the reporter apparently accepted. I hope Mr. M. knows the difference now and is taking proper care of himself. Don't newspapers have medical editors anymore? The article is unfavorable to Meghan and sympathetic to her father--until the last few sentences in which Meghan is given some qualified praise. You are so right about the diagnosis of CHF. My aunt died from CHF at the age of 96 and never had an attack. And it is indeed a strange looking bill. It appears to be given right after the incident so I don't know why it took so long to be shown. If I were Meghan, my reasons for not talking to him would be (1) he never tied to call of his other daughter and indeed said it was Meghan's fault that she was behaving as she is. If Meghan had just invited Samantha to the wedding, he said, Samantha would be eating out of her hand. (2) He insulted Harry. (3) He insulted Meghan, saying she was what he made. (4) He won't keep his mouth shut about conversations. I think a fake heart scenario could have been forgiven as just weakness. I sincerely hope that the two brothers are still close. It would be very sad to have a rift now, when they’ve been through so much, and are just becoming splendid adults with beautiful families. Harry seemed so close to his brother and Kate - the jolly support he gave as best man when Will and Kate were married was so beautiful, and then all the fun, supportive and merry times he had with Kate before the children...I thought all we needed was for Harry to find the right one, and those four would lift the world with their modern, compassionate, fresh approach. To have anyone sour on Meghan, or treat her with anything less than love and welcome is a shame. Hopefully this is all blown out of proportion by the press and they all love each other truly. Meghan seems like a dream, like Kate did - and the RF is very lucky to have both. Happy holidays everyone, and to the royal family! Cheers! I could not agree more, Diane. Time magazine released its shortlist of candidates to be named its annual Person of the Year. The list includes special counsel Robert Mueller, Russian President Vladimir Putin and U.S. President Donald Trump. That’s the best they can do??? How exciting that Meghan's been nominated! Personally, I'd like to see her nominated in a couple of years, after she's settled in and worked more with her charities/causes. I think this nomination has much to do with her wedding and entry into the BRF and not necessarily what she's done. That being said I certainly can't deny her positive influence and if she does indeed make the cover, I'll be very happy indeed. I really hope it’s Jamal Khashoggi, he deserves to be on the cover more than anyone on the list. I love Meghan too but he deserves it. Do you think Meghan will do any engagements before we see her driving to the Christmas luncheon and the Sandringham walk? I really hope we do I miss her. I expect we'll see an event or two. There's nothing announced at present, however we are seeing an increase in unannounced events recently.